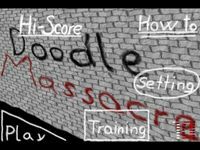 Doodle Massacre is a simple shooter game where you have to kill doodle/stick men while they try to escape running through a field and climbing a wall. As far as you progress in the game, your weapon gets quicker and stronger. Sometimes you can use a grenade to kill lots of them at once.